A long time ago I saw an advert for a game - by your actions you decided whether your character was good or evil. That game was Fable and as it was only available on the Xbox I had to buy the console to play the game. Fable was pretty much the first game I ever finished... and not withstanding the irritating guild master who would frequently interject with "Your health is low!" it was a fabulous game. Your hero could wander the world, completing quests, slaying monsters, and casting spells - all the usual fare you would expect from an RPG. Fable II was set in Albion again, although time had passed and the places changed bits were still recognisable. 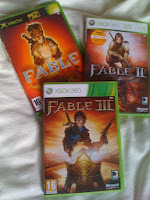 Fable II introduce online/co-op game play, which as I only have a handful of Xbox friends, wasn't of much interest to me. The guild master was gone (and indeed mocked in one of the loading screens). Otherwise things were much the same, stealing and murder turned your character evil and good deeds were rewarded. There was also now a dog to help the hero find buried treasure and warn when enemies were nearby. I finished Fable II as well, the story at any rate. 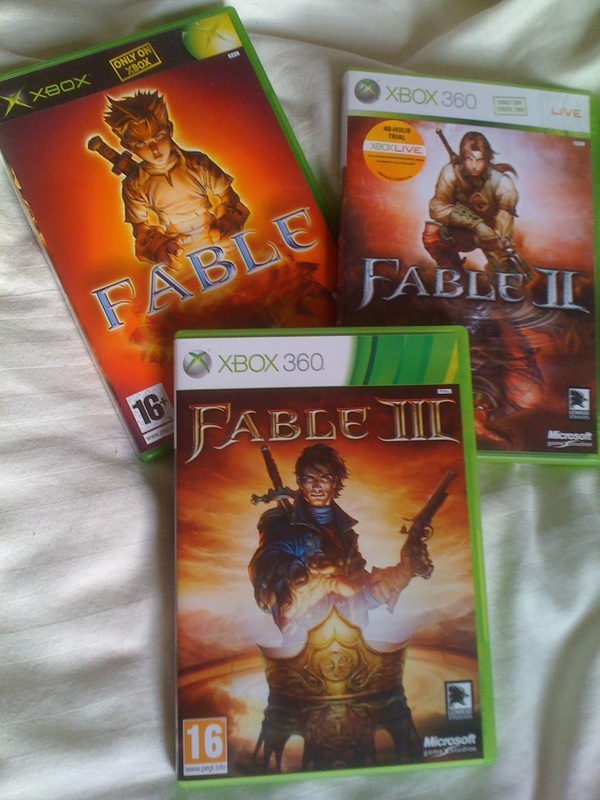 I was pretty excited earlier this year to learn that Fable III was in the pipeline and even more excited to learn that it was coming out just at the start of my week off which would afford me unrivalled game playing time. I've read interviews with the people who made the game where they state that they fixed all the annoyances of previous games. I couldn't disagree more. Fable III is back in Albion again. Time has passed (once more) and the hero this time is the child of the hero in Fable II. Somewhat confusingly the mediaeval world has in a short period of time turned into an industrialist society that seems far more advanced than is logical. The formerly silent hero now irritatingly joins conversations. There are no menus in game any more, having instead to return to the 'Sanctuary' which is a giant inventory/menu. The game is very slow as there are far too many guided scenes and cut scenes. The subtlety of choices for good or for evil has been replaced by requests to press buttons to make a choice. You can (as with the other games) ignore the main story line and go off and carry out your own quests, and the graphics are still amazing. The voice cast is also pretty impressive - Zoe Wannamaker is back as Teresa, John Cleese voices Jasper the butler and Stephen Fry puts in an excellent performance as villain Reaver. There is still the humour of the other games in the dialogue too; but the good points aren't enough to make up for what is a poor latest instalment to the trilogy.